Thank you to Australian Geographic for featuring my great white shark image on the cover of the March 2018 issue. The leafy seadragon has to be one of the strangest and most beautiful fish in the ocean. Leafy seadragons can be found year-round at Rapid Bay, only 90 minutes drive from the city of Adelaide in South Australia. Covered in leafy appendages (used only for camouflage), it grows to ~25cm (~10 inches) and is only found at a handful of locations along the southern side of Australia (WA, VIC and SA). It was my second trip to South Australia to find the leafy seadragons, after a failed trip in 2012 where we didn't managed to find any. After the disappointment of my last trip, it was a great relief to find the first dragon 2 minutes into the first dive! On this trip (April 2017) we saw many leafy seadragons under the old derelict jetty at Rapid Bay. Leafy Seadragon at Rapid Bay, South Australia. Old wife fish, under the old Rapid Bay jetty, South Australia. Bimini is the western-most island of the Bahamas, only 80km (~50 miles) off the coast of Miami. Its the best place in the world for close encounters with the endangered great hammerhead shark. Bimini is a quiet place, well-known to big game fisherman and Florida boat owners. During the prohibition era it was a supply point for rum-running into the south east of the USA. Ernest Hemingway also called Bimini home in the 1930s, attracted by the epic fishing tales from the island. The gulf stream runs just west of Bimini, supplying extraordinarily clear water all year round. I came to Bimini to see the great hammerhead sharks, who call the waters just west of South Bimini home from late December to March. After fleeting glimpses of great hammerheads on earlier trips to French Polynesia and the Bahamas, I was keen to see them up close. Great hammerhead shark, Bimini, Bahamas. The great hammerhead is the largest of the hammerhead species, growing up to 6 meters (20 feet) long. 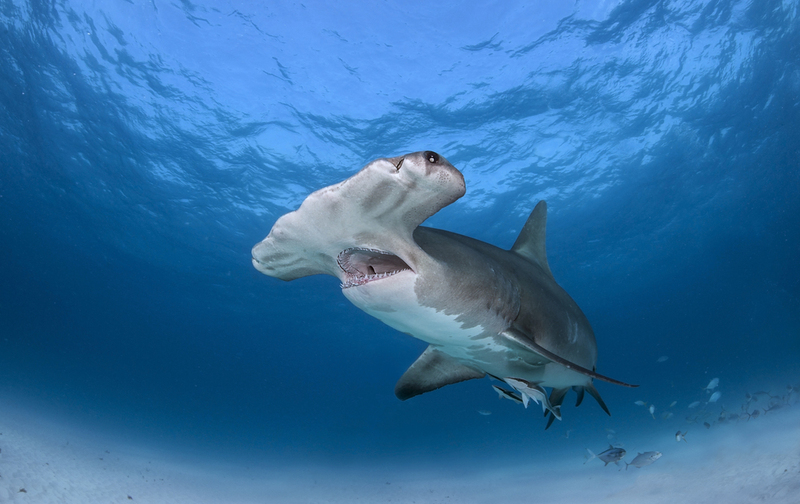 The great hammerhead has been heavily fished for its enormous sickle-shaped first dorsal fin, resulting in its inclusion on the endangered species list. The hammerheads we dove with in Bimini were between 3 and 4 meters (10 to 13 feet). 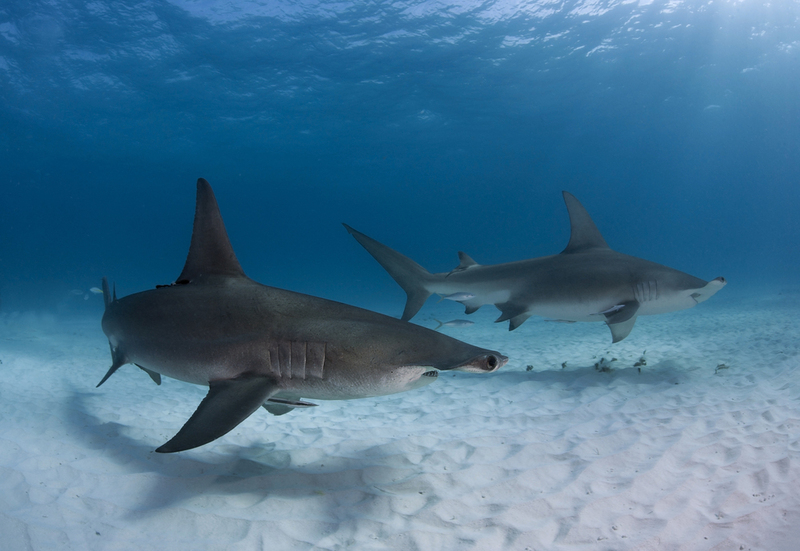 We typically had three to five great hammerheads at any one time, along with a half dozen nurse sharks. 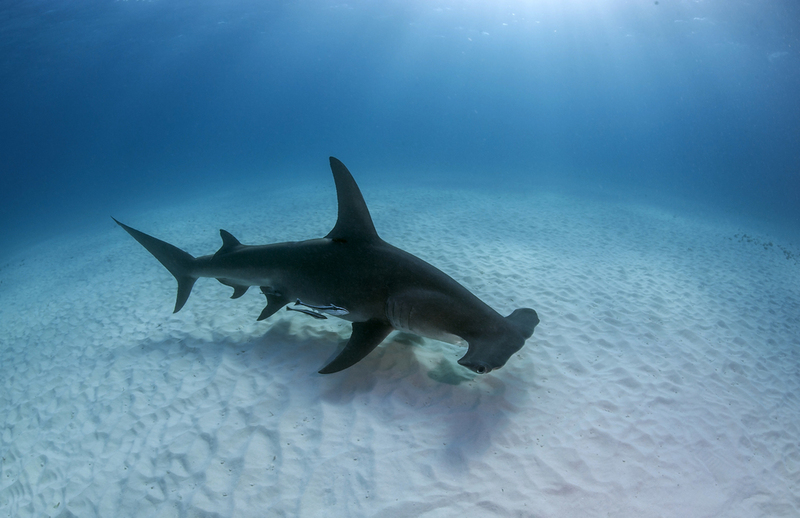 Unlike most other spots around the world, the great hammerheads in Bimini come right up to divers, typically swimming just above the sand in ~5 meters (16 feet) of water. They have the tightest turning circle I’ve seen of any shark. The cephalofoil (hammer) was surprising hard when they gently bumped into my camera. The hammerheads moved gracefully and deliberately through the water, never attempting to sneak up on us (unlike bull & tiger shark behaviour). The position of their mouth relative to the cephalofoil gives you further confidence that an exploratory bite is highly unlikely to occur, even with a diver that's not paying attention. The global shark attack file (logs 5,800+ incidents over the last ~150 years) doesn’t have any conclusive deaths from hammerhead sharks (a few deaths were reported as “potentially a hammerhead or tiger shark”). After spending a week with these sharks it doesn’t surprise me that they are not responsible for any deaths. The Bahamas is an extraordinary place for shark diving, thanks to the establishment of the Bahamas Shark Sanctuary. On this trip to Bimini we saw great hammerheads, nurse sharks, Caribbean reef sharks and bull sharks. The Big Game Fishing Club in North Bimini has resident bull sharks that are visible below the club jetty. We had a single bull shark on the last day of diving that may have been attracted by the spearfishing from our boat. This bull shark was relatively shy and wouldn’t come close enough to be photographed. I understand bull sharks became a bit of a problem for the great hammerhead diving in Bimini late in the 2014 season. Local divers speculate the high number of bull sharks was due to US liveaboard boats chumming the water in the area 24 hours a day. Through the 2014 season the bull sharks became gradually bolder, eventually scaring away the great hammerheads and leading to a dive that required a high level of focus / alertness to ensure the safety of divers. Neal Watson's Bimini Scuba Center, based out of Bimini Sands, did a great job of finding and keeping the sharks and had the right balance of experience, flexibility and safety. The Neptune Islands are located in the Spencer Gulf in South Australia, about 6-8 hours boat ride south of Port Lincoln. The Neptune Islands are renowned as one of the best places in the world to see large great white sharks. It was my third trip to the Neptune Islands with the Rodney Fox team, and my 2nd trip with regular dive buddy Andy Thirlwell (www.andythirlwell.com). We were lucky enough to have excellent conditions for the entire trip. We had more sharks than we knew what to do with, excellent visibility and unusually warm water. We travelled in the Australian winter (June - August), as this is generally the best season to find large female Great White Sharks around the Neptune Islands. We had up to seven Great Whites at a time, with some sharks approaching lengths of up to 5 metres (16.5 feet). Great white shark at the Neptune Islands. My favourite image of the trip was taken late in the afternoon of the last day, when a large Great White came in close with his jaws open at just the right angle for the setting sun to illuminate the inside of his mouth (see below). The fisheye lens distortion makes the shark's head appear enormous and cartoonish relative to its body. Great white shark at the Neptune Islands with the afternoon sun in his mouth. Previous trips to the Neptune Islands had been cut short by large seas, a regular occurrence in this part of the world in winter. When the seas are calm, the nearby Hopkins Island colony of endangered Australian Sea Lions can be visited. I've wanted to dive with the Sea Lions at Hopkins Island for more than a decade, but had missed out on earlier trips due to poor weather. Finally, on this trip we got the opportunity to get in the water with these beautiful animals. Highly curious, interactive and set within a stunning underwater landscape, it was one of nicest dives I can remember. I highly recommend a trip to Hopkins Island if you're in this part of the world. Australian Sea Lion at Hopkins Island.